Dwayne Johnson wants you to follow the "Hercules" diet and workout regime and share your journey with him. The Rock is throwing down the gauntlet, to you. Dwayne Johnson went on an incredibly challenging Hercules diet and workout regime to get in shape for the movie, which opens on July 25, and now he wants you to go through the same pain! The Rock has launched teamhercules.com and wants you to share your photos and videos with him at #TeamHercules as you get yourself into physical condition similar to "the world's first superhero." The workout was accompanied by this message: "Let's kick this sumbitch off right... Here's my back aka 'slabs' workout that I did for HERCULES. Push yourself, hit it strong and be sure to concentrate on good form. And for the love of all that holy in the world of iron -- FOCUS! 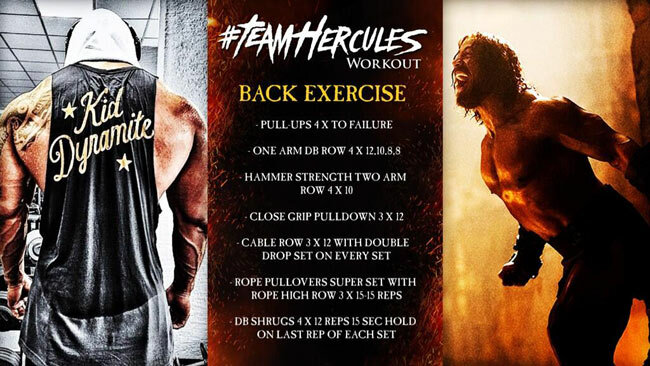 Have fun and send me your progress... #B2A #TeamHercules"
On an aside, The Rock also thanked fans for making the Hercules movie trailer the most watched trailer on YouTube. So, are you ready to pit your body against the punishment Mr. Johnson endured last year before and during the shoot in Budapest? Do you want to be part of this game or do you just want to stay on the sidelines? Visit teamhercules.com and stay in the loop of all updates, diets and workouts posted.